There are an estimated 370 million Indigenous peoples worldwide, living in 70 different countries, according to the United Nations (U.N.) Permanent Forum on Indigenous Issues. Despite vast diversity among Indigenous groups around the world, Indigenous populations share similar experiences and struggles. Settler states and governments typically represent settler society, which is often more populous and powerful than the Indigenous inhabitants of the country. In this situation, Indigenous populations have become socio-economically disadvantaged and vulnerable to discriminatory state policy and even to outright armed repression. A major thrust of much colonial and state policy has been the attempt to assimilate Indigenous groups both by force of arms and through more subtle pressures to conform to the dominant society. Some assimilation policies, such as child apprehension, have taken similar forms across the globe. In Canada during the Sixties Scoop, Indigenous children were removed from their homes and handed over to non-Indigenous families; in Australia the targets of a similar policy are known as the Stolen Generation. In many countries, governments ran programs of indoctrination under the guise of education (the residential school system in Canada, and the industrial schools of the United States, for example). What do we mean by Indigenous? 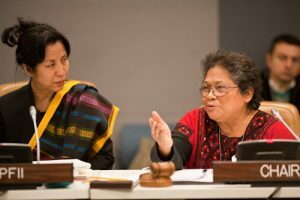 Chandra Roy-Henriksen and Myrna Cunningham at the Expert Group Meeting on Indigenous Peoples and Forests. Photo by Broddi Sigurdarson, January 2011. (c) 2011 UNPFII. Photo used with permission from UNPFII. Under international law, there is no official definition of Indigenous, although the United Nations generally identifies Indigenous groups as autonomous and self-sustaining societies that have faced discrimination, marginalization and assimilation of their cultures and peoples due to the arrival of a larger or more dominant settler population. The word Indigenous was adopted by Aboriginal leaders in the 1970s after the emergence of Indigenous rights movements around the world as a way to identify and unite their communities and represent them in political arenas such as the United Nations. Indigenous was chosen over other terms that leaders felt reflected particular histories and power dynamics, or had been imposed by the colonizers. Given the diversity of Indigenous experience, no universally accepted definition has been drafted. Indigenous communities, peoples and nations are those which, having a historical continuity with pre-invasion and pre-colonial societies that developed on their territories, consider themselves distinct from other sectors of the societies now prevailing in those territories, or parts of them. They form at present non-dominant sectors of society and are determined to preserve, develop and transmit to future generations their ancestral territories, and their ethnic identity, as the basis of their continued existence as peoples, in accordance with their own cultural patterns, social institutions and legal systems. Under Aboriginal legal traditions and treaties, individual and group rights are neither separate nor in conflict; our individuality depends on our collective heritage and identity. Indigenous rights include both group rights, or collective rights, and individual rights. Historically, Western society has emphasized individual rights and freedoms—seeking, basically, to protect the individual from abuses by the state or other powers. Canada’s Charter of Rights and Freedoms predominantly protects individual rights, although section 25 guarantees the protection of Aboriginal rights, and sections 16 and 23 protect some group language and cultural rights. Section 35 of the Constitution further recognizes and affirms Aboriginal rights. In most Indigenous societies both collective and individual rights are recognized. Group rights, such as the right to practice culture and customs, the right to self-determination, the right to subsistence economies, the right to governance, and the right to land, protect the foundations of the society. They can be critical when these societies and cultures are threatened. The majority of the world’s Indigenous populations seek state recognition of these collective rights in order to protect and strengthen their societies. International human rights instruments, which have been designed principally by Western-liberal societies, have overlooked collective rights in favour of individual rights. However, with the emergence of the international Indigenous rights movement in the latter half of the twentieth century, policymakers have been obliged to balance individual rights with collective rights through new international instruments. Chief Levi General (1873–1925), now better known as Chief Deskaheh, was a hereditary chief of the Cayuga Nation within the Haudenosaunee Six Nations Confederacy. When the federal government tried to overthrow traditional leadership and governance systems for an elected band council system in 1923, Deskaheh fought to keep the existing Haudenosaunee systems in place. He collected petitions and traveled to Geneva, Switzerland on a passport issued by the Haudenosaunee Confederacy in order to speak with the League of Nations. Unfortunately, the League of Nations refused to address his concerns, as they recognized Canada’s sovereignty over the Haudenosaunee. Deskaheh returned to North America but settled in New York to escape harassment and targeting from the RCMP who would eventually succeed in dismantling the traditional Haudenosaunee government. Deskaheh passed away shortly after in 1925, but to this day remains an important figure in leadership and bringing Indigenous rights to the international stage. From the earliest days of contact between Indigenous peoples and the colonial powers, Indigenous people have asserted their rights through appeal, negotiation, direct action and even armed rebellion—generally directed against the occupying colonial state and its representatives on the ground. However, the rise in the twentieth century of multilateral fora like the League of Nations and, later, the United Nations and its agencies, brought new initiatives from Indigenous groups. Indigenous efforts were aimed both at making common cause, first regionally and then globally, and at entering the International arena as sovereign players independent of the states that surrounded and divided them. Beginning in the 1920s and ‘30s, Indigenous leaders approached the League of Nations, and eventually the United Nations, hoping to have their concerns addressed. These leaders were frequently sent back home to deal with their domestic governments, as the League of Nations and the United Nations did not view Indigenous rights as an international issue. Once European colonial powers established borders, they treated Indigenous peoples and their concerns as domestic matters, even though colonialism was an international enterprise.5 Indigenous nations had found themselves divided by newly-imposed international borders, or lumped together with other groups entirely. This made it particularly challenging to find a forum that would deal with their demands instead of eschewing responsibility. Indigenous leaders began to unite with other Aboriginal groups to increase their effectiveness in the fight for their rights. Since the 1970s, increasing numbers of Indigenous peoples have organized across geographic and political borders, bringing international attention to their common struggles despite their vastly different cultures and locations. These organizations vary from global organizations such as the World Council of Indigenous Peoples to smaller organizations, such as the Coast Salish Gathering, that reunite cultural groups divided by political borders. The first major period of international organizing among Aboriginal populations occurred during the 1970s. In 1973, the first Arctic Peoples’ Conference was held in Copenhagen to acknowledge and address common issues and rights among Arctic populations. The conference comprised representatives from its Greenlandic founding organizations, Canada (members of the Inuit Tapiriit Kanatami and the National Indian Brotherhood), as well as the Saami of Scandinavia. The following year, in 1974, the International Indian Treaty Council was formed in South Dakota, an offshoot of the American Indian Movement. It was one of the first international Indigenous organizations to gain recognition at the United Nations, with consultative status to the U.N. Social and Economic Council awarded in 1977. The IITC maintains a strong Canadian presence in the Treaty 6 area. Around this time, George Manuel, of the Shuswap Nation in British Columbia, then president of the National Indian Brotherhood of Canada, began visiting Indigenous communities around the world, including nations in Tanzania, Scandinavia, and New Zealand, to learn first hand their experiences and struggles. 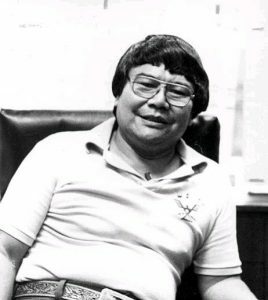 He then decided to form an international organization that would unite Indigenous groups across the globe in order to raise international awareness and fight for their right to self-determination.6 In 1974, he founded the World Council of Indigenous Peoples. The WCIP eventually gained observer status at the United Nations, with a secretariat based in Lethbridge, Alberta. Before it dissolved in 1996, the WCIP represented over 600,000 Indigenous people worldwide.7 Read the WCIP declaration of principles here. The first WCIP conference, held in 1975 in Port Alberni, British Columbia, was hosted by the Tseshaht First Nation and attended by over 250 Indigenous people from Scandinavia, Australia, New Zealand, the United States, Canada, and Central and South America.8 Arctic leaders at the gathering used it to plan a specifically pan-Arctic meeting for June 1977. This gathering would become the Inuit Circumpolar Council (ICC). The ICC was founded by Eben Hopson, of the Alaskan Inupiat nation, in order to unite Inuit who live in different countries but share the same homeland and to raise awareness to their way of life.9 The ICC is still active as a non-governmental organization that represents approximately 150,000 Inuit people across Alaska, Canada, Russia, and Greenland and, for a time, the Saami of Scandinavia. The ICC has consultative status at the United Nations, and is currently active on issues of climate change, Arctic sovereignty, and, particularly in Canada, the recent European ban on seal exports. Transnational Indigenous organizations have been created all around the world. The Indigenous Peoples of Africa Coordinating Committee is an umbrella organization representing Indigenous peoples across the African continent. The Asian Indigenous Women’s Network unites Indigenous women of the Asian continent, and the Asia-Pacific Indigenous Youth Network similarly organizes Indigenous youth in Asia. In the Arctic, aside from the ICC, the Sami are represented in the Sami Parliaments of Norway, Finland, and Sweden. Norway was the first country to establish a Saami Parliament in 1989, with Sweden to follow in 1993 and Finland in 1996. In Canada, the Assembly of First Nations (AFN) gives a unified voice to First Nations across Canada, in federal politics as well as on the international stage. The AFN participated in drafting the U.N. Declaration on the Rights of Indigenous Peoples and in negotiations of the U.S.-Canada free trade agreement. On the domestic front, the AFN worked on constitutional amendments in the 1980s, the Charlottetown Accord, and the Meech Lake Accord. In the Pacific Northwest, The Coast Salish Gathering represents Coast Salish peoples on both sides of the U.S.-Canadian border. The Gathering was the first transnational political organization to represent Coast Salish peoples. Members meet several times a year to analyze policy and propose recommendations on issues that impact Coast Salish peoples collectively despite the political border. These include fishing, resource extraction and other environmental issues affecting their shared ancestral homeland. 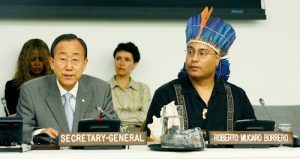 Secretary-General Ban Ki-Moon and Roberto Borrero, Chair of the NGO Committee on the International Day of the World’s Indigenous People, 2010. Photo by Evan Schneider. (c) 2010 UNPFII. Photo used with permission from UNPFII. In 1982, the U.N. Working Group on Indigenous Peoples was established by Indigenous organizations and U.N. member states. The UNWGIP was made up of five independent experts and advised by Indigenous volunteers. One of the UNWGIP’s goals was to increase international standards in regards to Indigenous rights, and in 1994 the group drafted the U.N. Declaration on the Rights of Indigenous Peoples (UNDRIP). 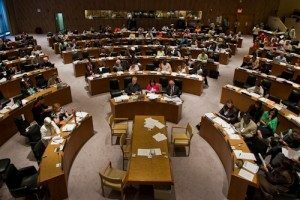 Thirteen years later, the UNDRIP was finalized and adopted by the U.N. General Assembly. The Working Group continues to meet annually in Geneva. The Seventh Session of the United Nations Permanent Forum on Indigenous Issues, May 2, 2008. (c) 2008 UNPFII. Photo used with permission from UNPFII. The UNDRIP, endorsed in 2007 by 144 U.N. member states, is one of the most important products of Indigenous activism at the United Nations. With its adoption, attention among Indigenous activists has now turned toward the challenges of implementation: how rights can be implemented and success can be measured. In order to support implementation, the U.N. Human Rights Council has created the Expert Mechanism on the Rights of Indigenous Peoples to facilitate the work of U.N. groups regarding Indigenous peoples. The Expert Mechanism is an advisory body that appoints five independent experts to advise the UNHRC. Since its first session in 2008, the Expert Mechanism has met annually over the course of one to three days. Each session addresses a different theme (for example, education in 2008) and is open to observers. Instruments such as the UNDRIP, along with increased transnational organizing by Indigenous peoples, have resulted in increased international support for Indigenous rights and a growing awareness of the importance of self-determination for Indigenous groups worldwide. Anaya, S. James. International Human Rights and Indigenous Peoples. Austin: Wolters Kluwer Law & Business, 2009. This recent volume presents Indigenous rights in an international legal perspective. Anaya, a law professor, served as the U.N. Special Rapporteur on the Situation of Human Rights and Fundamental Freedoms of Indigenous Peoples. ———. International law and Indigenous Peoples. Aldershot, UK: Ashgate Dartmouth, 2003. ———. Indigenous Peoples in International Law. 2nd ed. New York: Oxford University Press, 2004. Beier, J. Marshall, ed. Indigenous Diplomacies. New York : Palgrave Macmillan, 2009. Bodley, John H. Victims of Progress. Lanham, MD: Altamira Press, 2008. Cohen, Cynthia Price. The Human Rights of Indigenous Peoples. Ardsley, NY: Transnational Publishers, 1998. Dunbar-Ortiz, Roxanne. “The First Decade of Indigenous Peoples at the United Nations.” Peace and Change, 31, no. 6 (2006), 58–74. Ewen, Alexander, ed. Voice of Indigenous Peoples: Native People Address the United Nations. Santa Fe: Clear Light Publishers, 1994. Although a bit out of date, this collection of addresses to the United Nations by Indigenous delegates the world over remains valuable. Gray, Andrew. “Peoples, persons, and plurals.” In Indigenous Rights and Development: Self-Determination in an Amazonian Community, 127–33. Providence, RI: Berghahn Books, 1997. This chapter describes the movement to have the term Indigenous peoples, rather than the singular people, used in U.N. conventions and related instruments, and the significance of the change. Hall, Thomas, and James V. Fenelon. Indigenous Peoples and Globalization: Resistance and Revitalization. Boulder: Paradigm Publishers, 2009. In this recent work, Thomas and Fenelon explore how globalization has influenced and impacted Indigenous peoples’ movements throughout history, using case studies from India, Mexico, New Zealand, and the United States. This book is a rare examination of the links between globalization and Indigenous movements, and includes recommended readings for further research. Haveman, Paul. Indigenous Peoples Rights in Australia, Canada, and New Zealand. Auckland and New York: Oxford University Press, 1999. Henderson, James Sa’ke’j Youngblood. Indigenous Diplomacy and the Rights of Peoples: Achieving U.N. Recognition. Saskatoon: Purich Publishing, 2008. Maaka, Roger C.A., and Chris Andersen, eds. The Indigenous Experience: Global Perspectives. Toronto: Canadian Scholars’ Press, 2006. Niezen, Ronald. The Origins of Indigenism: Human Rights and the Politics of Identity. Berkeley: University of California Press, 2003. Thornberry, Patrick. Indigenous Peoples and Human Rights. New York: Juris Publishing, 2002. Wilmer, Franke. The Indigenous Voice in World Politics: Since Time Immemorial. Newbury Park, CA: Sage Publications, 1993. 1 Roxanne Dunbar-Ortiz, “The First Decade of Indigenous Peoples at the United Nations,” Peace and Change, 31, no. 6 (2006): 60. 2 Paul Coe, personal correspondence with Erin Hanson, March 2010. 3 Linda Tuhiwai Smith, Decolonizing Methodologies: Research and Indigenous Peoples (London: Zed Books, 1999), 6. 4 James Sa’ke’h Youngblood Henderson, Indigenous Diplomacy and the Rights of Peoples: Achieving U.N. Recognition (Saskatoon: Purich Publishing, 2008), 37.